I had every intention of documenting this year’s garden more thoroughly, but as things tend to go, the days got busy and the year got away from me. Now here we are in mid-October, still waiting for the first frost but accepting its imminence, watching reluctantly as another growing season comes to a close. We took several pictures but few notes, so what follows is a series of photos and a few reflections on what transpired this past year in, what Flora likes to call, Our Backyard Farm and Garden Show. I guess I should start at the beginning. Last year I was living in an apartment. I was growing things in two small flower beds and a few containers on my patio. That had been my story for about a decade – growing what I could on porches and patios and in flower beds of various apartments in a few different parts of the country. 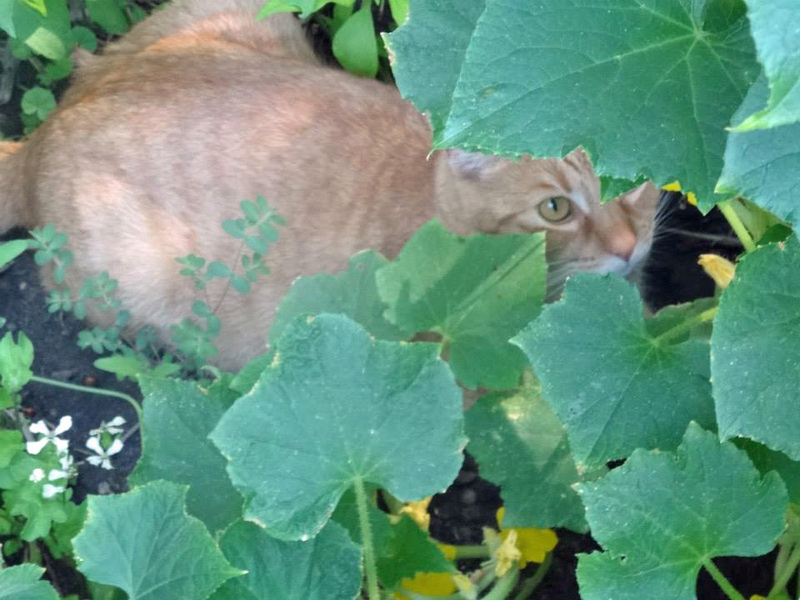 At one point I was living in an apartment with no space at all to grow anything, and so I attempted to start a garden in the backyard of an abandoned, neighboring house – geurilla gardening style – but that didn’t go so well. At another location I had a plot at a community garden. The three years I spent there were fun, but definitely not as nice as stepping outside my door and into my garden. Earlier this year, I moved in with Flora. She was renting a house with a yard, so when I joined her, I also joined her yard. Flora is a gardener, too; she had spent her first year here growing things in the existing garden spaces but wanted to expand. So we did. We enlarged three beds considerably and built four raised beds and two compost bins. We also got permission to grow things in the neighbor’s raised beds. And that’s how our growing season started – coalescence and expansion. Then summer happened. It came and went, actually. Most days were spent just trying to keep everything alive – moving sprinklers around, warding off slugs and other bugs, and staking things up. Abundance was apparent pretty much immediately. 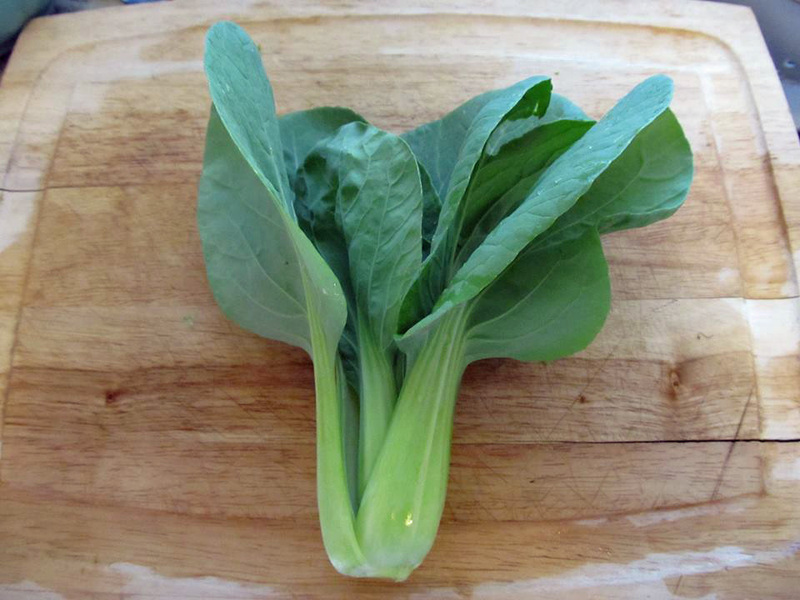 We started harvesting greens (lettuce, kale, collards, mustards) en masse. Shortly after that, cucumbers appeared in concert with beets, turnips, basil, ground cherries, eggplants, tomatoes, carrots, peppers, etc. Even now – anticipating that first frost – the harvest continues. We are uncertain whether or not we will remain here for another growing season; regardless, we are considering the ways in which we might expand in case we do. Despite the amount of work that has gone into our garden so far, we still want to do more. Apparently, our love of gardening knows no bounds. A view of our side yard. 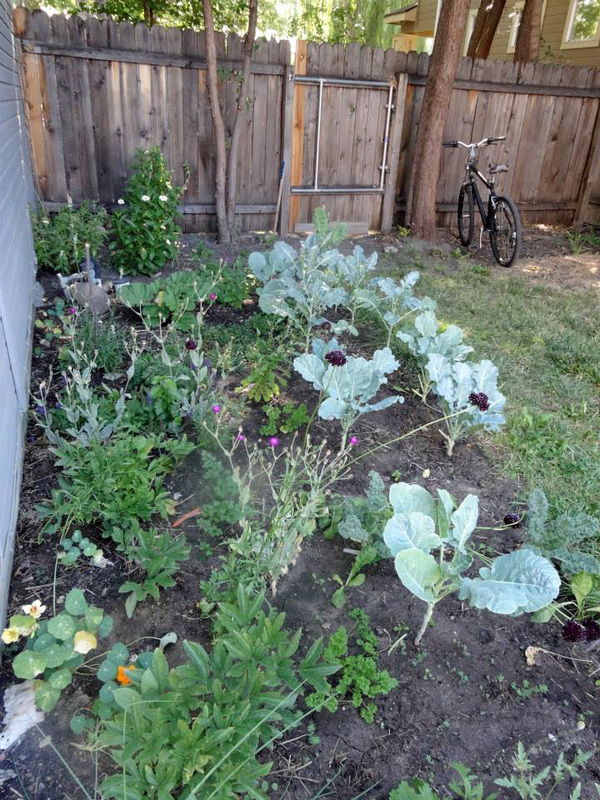 It is pretty shady in this bed but we were still able to grow kale and collards along with several different flowers and herbs. We grew many varieties of lettuce. This is one that I was most excited about. It’s called ‘Tennis Ball.’ It is a miniature butterhead type that Thomas Jefferson loved and grew in his garden at Monticello. 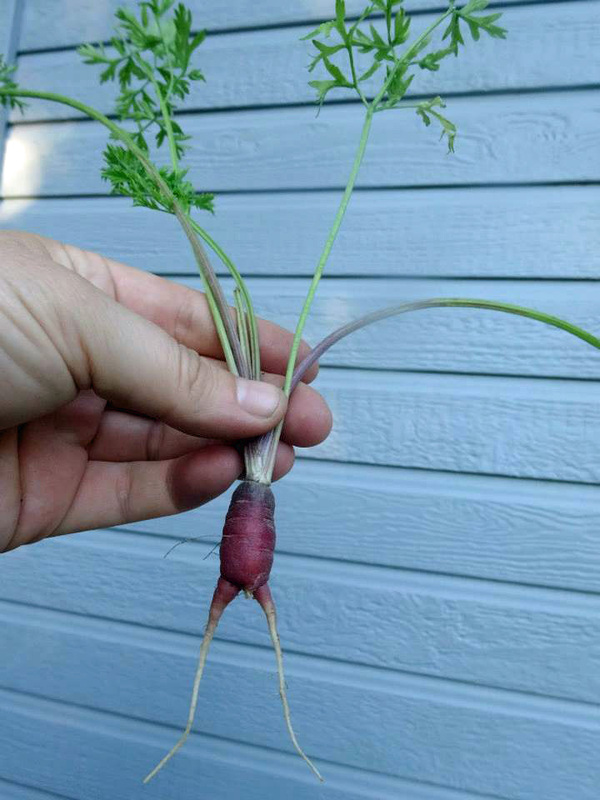 A miniature purple carrot with legs. 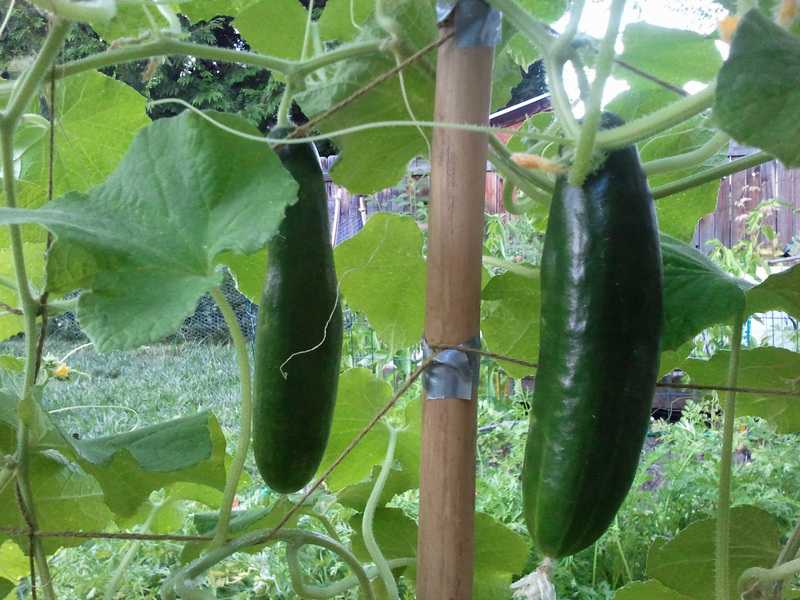 Two cucumbers hanging on a makeshift trellis. I can’t remember what variety they are. This why I need to remember to take better notes. 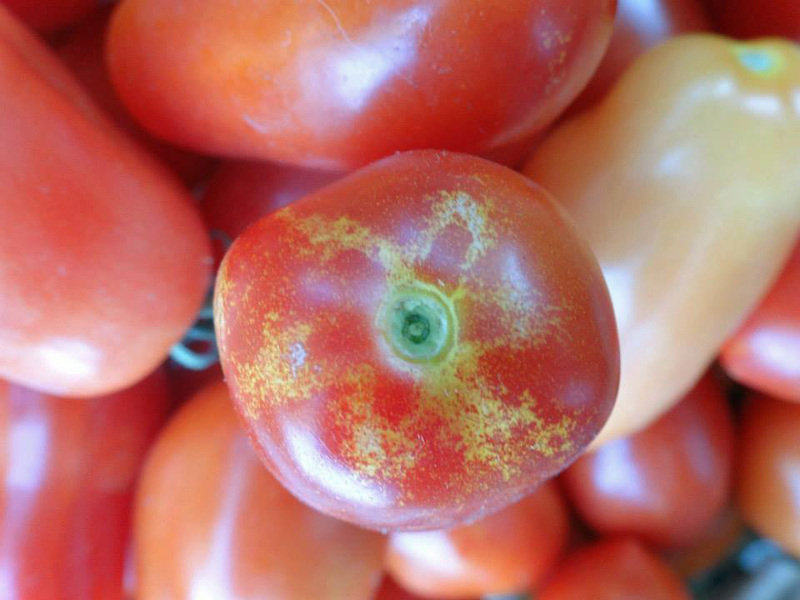 ‘San Marzano’ Roma Tomatoes. We grew three other varieties of tomatoes along with this one. 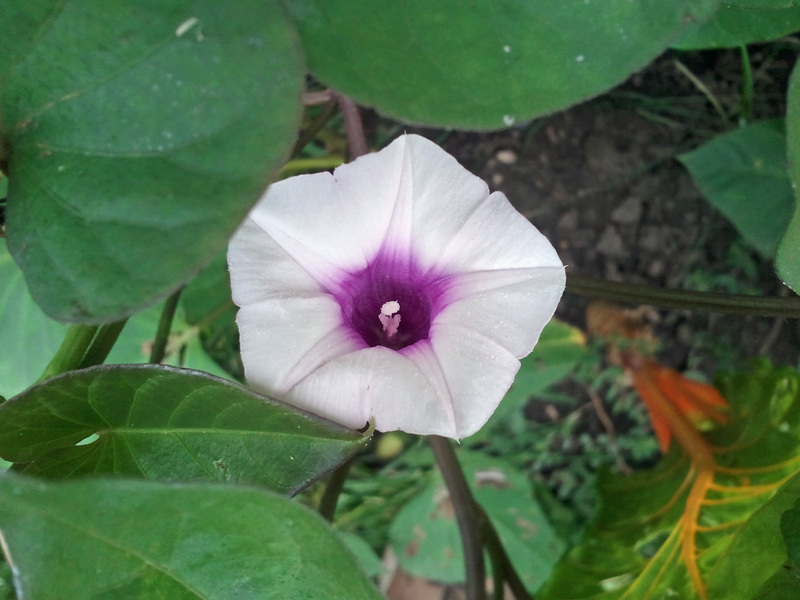 The flower of a ‘Hong Hong’ sweet potato. We have not harvested these yet, so we are not sure what we are going to get. Sweet potatoes are not commonly grown in southern Idaho, so we are anxious to see how they do. We grew lots of flowers, too. 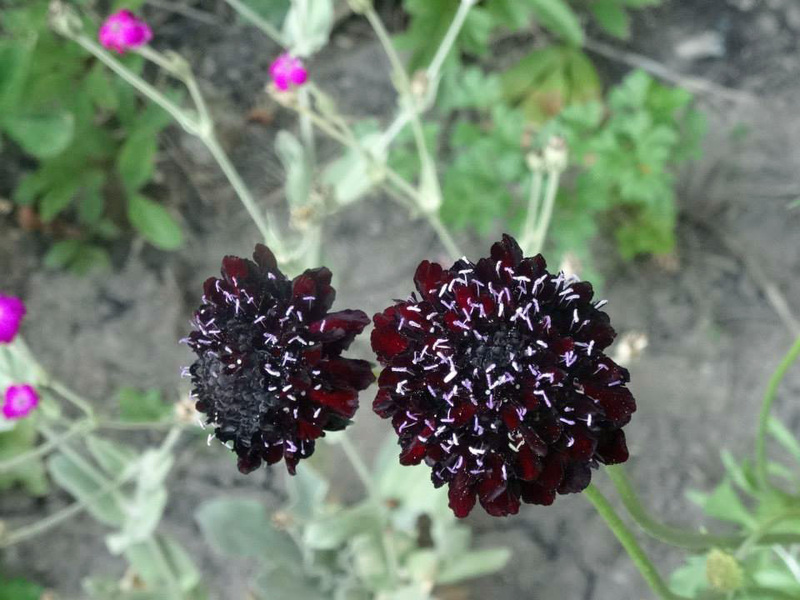 ‘Black Knight’ scabiosa (aka pincushion flower) was one of our favorites. 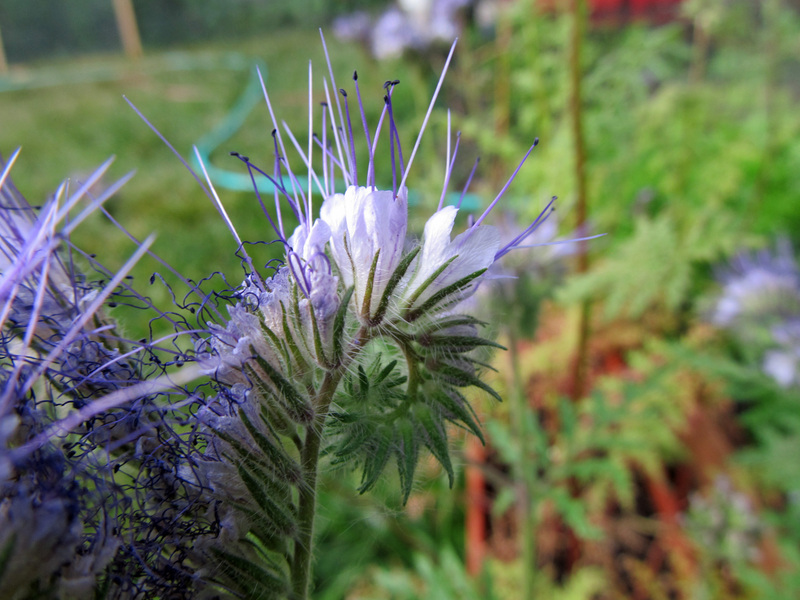 We grew some flowers specifically for the bees, like this bee’s friend (Phacelia tanacetifolia). 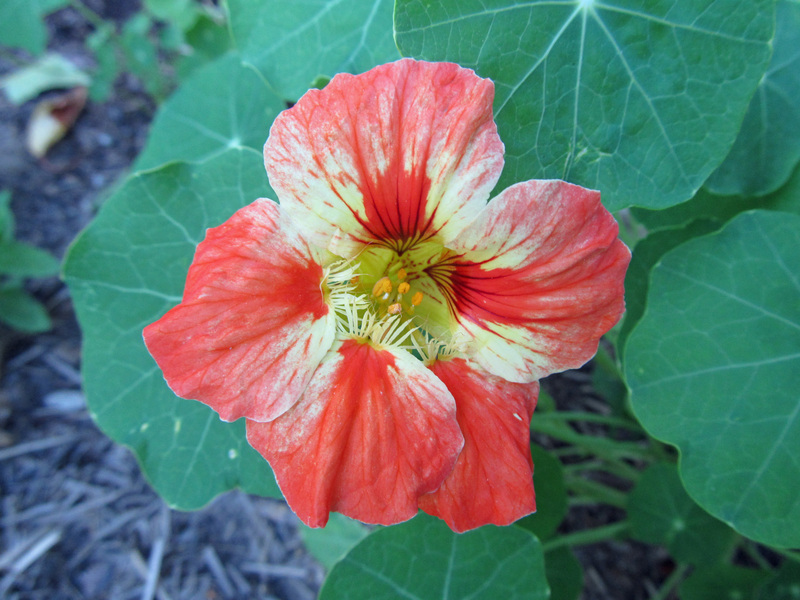 We grew other flowers for eating, like this nasturtium. It has been an incredible year. “Abundant” is the best word that I can think of to describe it. We have learned a lot through successes and failures alike, and we are anxious to do it all again (and more) next year. Until then we are getting ready to settle in for the winter – to give ourselves and our garden a much needed rest. For more pictures and semi-regular updates on how our garden is growing, follow Awkward Botany on tumblr and twitter, and feel free to share your gardening adventures in the comments section below. Marigolds are easily one of the most commonly grown annual flowers. They are so common and pervasive, in fact, that they are often overlooked and underappreciated. I, for one, had discounted marigolds long ago, seeking instead for plants considered to be more rare, unconventional, and unusual to place in my garden. But then I started looking into this commonplace plant and, to my surprise, discovered that marigolds have great cultural significance in countries all around the world, both currently and historically. Suddenly, marigolds don’t seem quite so ordinary. Marigold is a common name for plants found in several genera, but in this case I am referring to plants in the genus, Tagetes, which is in the family, Asteraceae (also known as the sunflower family). Tagetes is a genus composed of at least 42 species, all of which are native to North and South America. 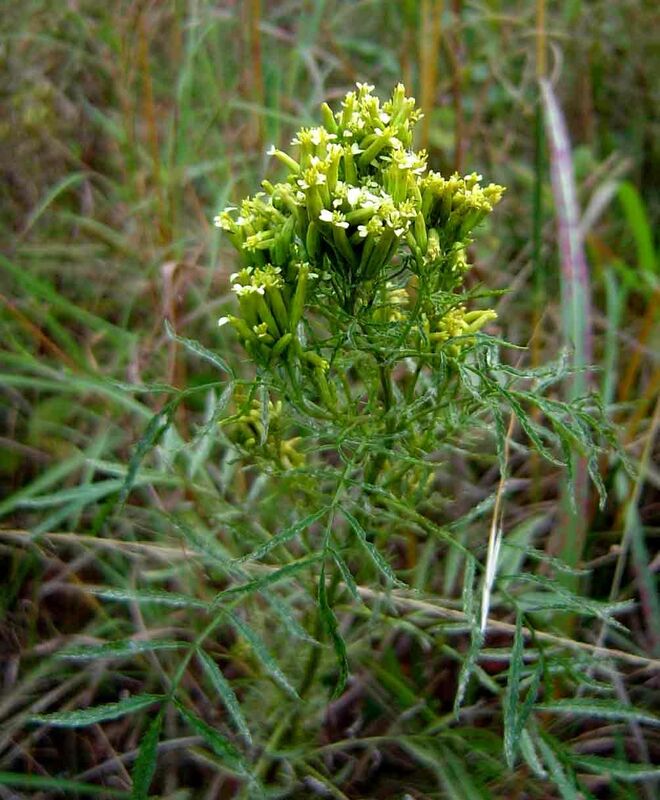 Plants in this genus range in height from a few inches to as tall as 6 feet or more. Like most other species in the sunflower family, their flowers appear to be single blooms but are actually clusters of two different types of smaller flowers: ray florets and disc florets. 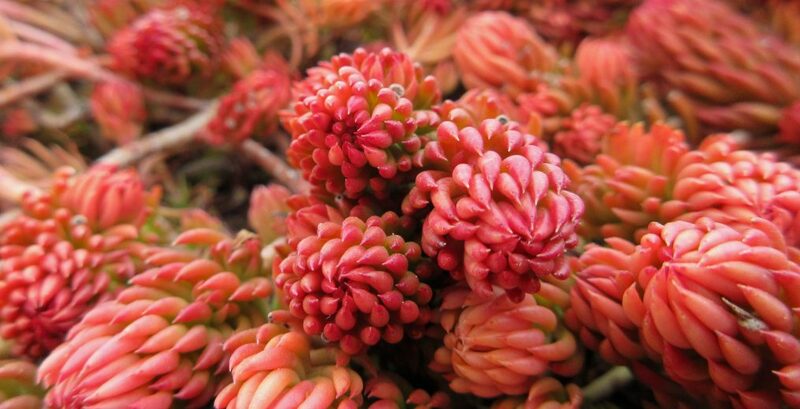 The flowers can be orange, yellow, golden, white, and, in some cases, maroon or with maroon accents. The leaves are usually finely divided and either oppositely or alternately arranged, and the leaves, stems, and flowers are highly aromatic. Marigolds grow in a variety of soil types, even those with minimal fertility. In gardens, they will perform best if they are grown in well-drained soil in full sun and are watered and deadheaded regularly. Even before marigolds gained worldwide popularity, they were commonly used among the people in their native range. They were of particular interest to the Aztecs, who considered marigolds a sacred plant and used them in religious ceremonies. Marigolds became known as the flower of the dead and are still used today during the Day of the Dead to adorn altars and graves. Marigolds were also an important medicinal plant for the Aztecs, especiallly T. lucida, which they used to treat fevers, stiffness, blisters, and various other ailments. 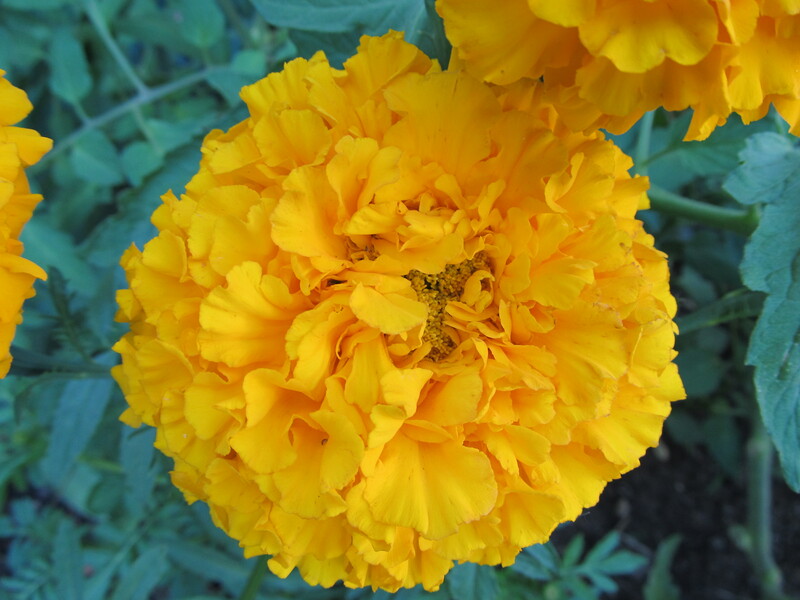 Spanish and Portugeuse explorers were introduced to marigolds by the Aztec people. The explorers brought marigolds back to their homelands and quickly spread them throughout Europe and into Africa and Asia. It was in Europe that they were given their common name, Mary’s gold, referring to the Virgin Mary and the color of the flowers. At the beginning of the 16th century, Portuguese explorers established a colony in India. The marigolds they brought with them have become a huge part of Indian culture and other cultures in that region. 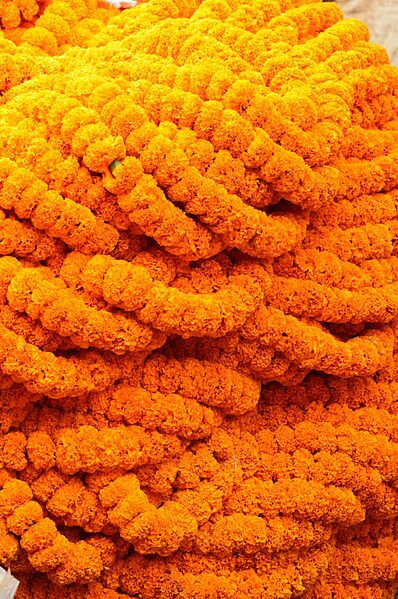 Today there are many large marigold farms in various parts of India, and marigolds are used widely to make garlands and other decorations for weddings, festivals, and religious ceremonies, as well as in foods and dyes. The flowers and leaves of marigolds are edible and have culinary and medicinal uses in many countries, especially those in South America. T. lucida and T. minuta are particularly popular for these uses. Marigold flowers have a citrus-like flavor, and T. tenufolia ‘Lemon Gem’ is said to be the best tasting marigold (although, having never eaten marigold flowers myself, I have no personal experience to back that up). The essential oil of T. minuta is frequently used in the fragrance industry and as a medicinal oil. 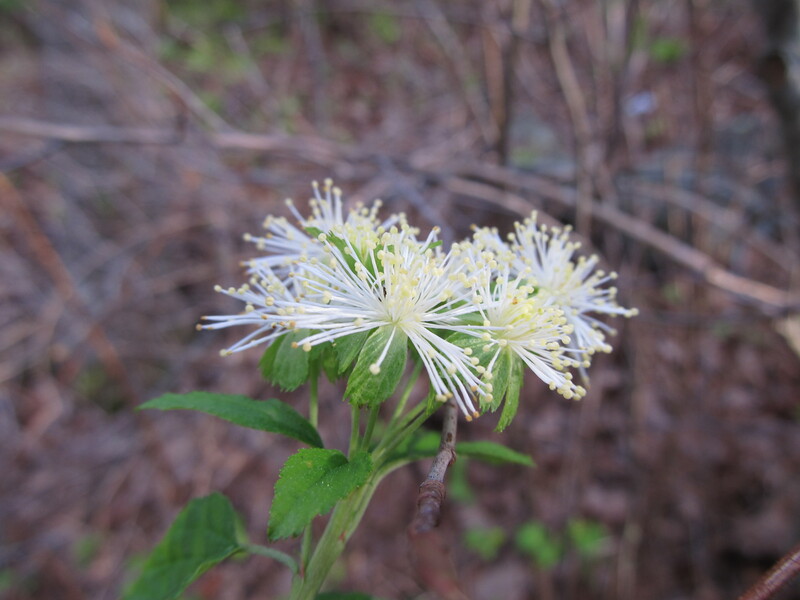 However, T. minuta has also become naturalized in many parts of the world, including Africa, Asia, and North America, and is considered an invasive weed species in these areas. Marigolds are often planted in vegetable gardens because they are assumed to repel pest insects and/or attract beneficial insects. Little research has been done to back up these claims. The one thing that I was able to confirm is that they have been found to reduce populations of nematodes in the soil. However, just interplanting marigolds among vegetable plants is not enough; instead, a large number of marigolds would need to be planted and then tilled into the soil in order to have the desired effect. Surely marigolds attract pollinating insects, but do they repel pests (apart from nematodes) or attract other beneficial insects? If you have an answer to this, comment below. I have marigolds in my garden this year, partly due to my newfound appreciation of them. If you’d like to see pictures of my marigolds, along with pictures of other things I’m growing, seeing, and doing, subscribe to my tumblr and/or follow me on twitter. 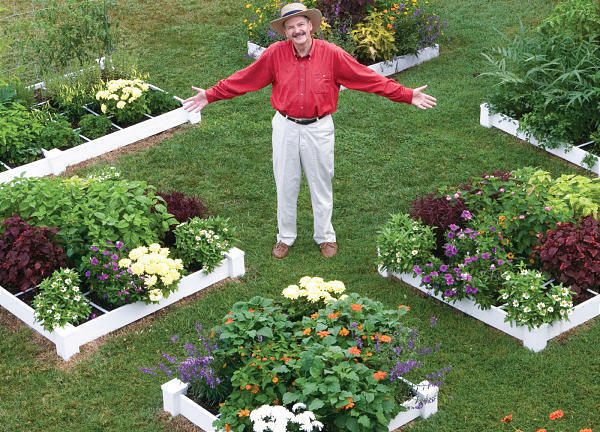 Square foot gardening is a method of gardening that was described and popularized by Mel Bartholomew. The basic concept is simple: measure out your garden beds into equal squares (4 feet by 4 feet) and then plant individual crops into each square following specific spacing recommendations for each crop. The square foot method is intended to eliminate the inefficiencies of standard row planting, making vegetable crops easier to plant, maintain, and harvest. Bartholomew’s book about square foot gardening was first published in 1981. From that book came a television series on PBS, various other books and updated versions of the original book, a square foot gardening product line, and the Square Foot Gardening Foundation. As a long time gardener, I had been familiar with Bartholomew’s book and its basic premise for a while but had never read it until recently. I found the book to be basically what I expected: a description of how to garden in squares instead of rows. I can see how this system could be very simple, attractive, and efficient while simultaneously producing decent sized yields; however I felt like Bartholomew’s description of the process made gardening into a very methodical, calculated, and meticulous task bordering on joyless. I’m sure that’s not how he sees it (nor how it really is), but then again, he’s a retired engineer [insert smiley face here]. For a long time I’ve had an interest in green roofs. I even went to graduate school to study them. So when I got to the part in Bartholomew’s book where he talks about square foot gardening on rooftops, I was intrigued. Green roofs (along with rooftop vegetable gardening) have become fairly common in urban areas in the past decade or two. And for good reason. Green roofs offer myriad benefits including mitigating storm water runoff (and the numerous sub-benefits involved with that), reducing the urban heat island effect, increasing a building’s energy efficiency, and re-introducing green space and wildlife habitat that was lost when a building was built. Vegetable gardening on rooftops is a practical solution for residents of urban areas where space for gardens on the ground is limited. Restaurants – like Noble Rot in Portland, Oregon and Café Osage in St. Louis, Missouri – have found that they can grow some of the produce and herbs they need on their rooftops while simultaneously setting themselves apart from other restaurants. 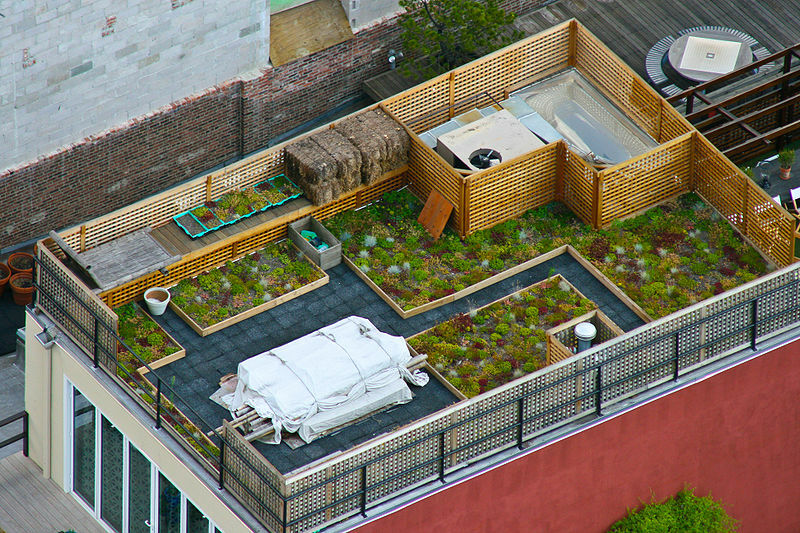 There are also a few urban farming operations on rooftops (Brooklyn Grange and Eagle Street Rooftop Farm for example). Michigan State University (an institution with one of the most prominent green roof research labs in the U.S.) has a research program dedicated to improving rooftop vegetable crop production. So with this recent trend of growing food on rooftops, I was curious to read what Bartholomew was saying about the subject more than thirty years ago, back when green roof vegetable gardening was less than mainstream. The reality is that square foot rooftop gardening gets only a brief mention in Bartholomew’s book (at least in the first edition – perhaps he has more to say about it in more recent editions), but what he does have to say is relevant. Each of these three considerations (wind, heat, and weight) continue to be considerations for any vegetated roof whether it includes vegetable crops or not. Yet people are figuring out how to overcome these obstacles, constructing and maintaining incredible rooftop gardens that are both productive and beneficial. In future posts, I intend to elaborate more on this topic, profiling individuals, groups, and organizations that are making this sort of thing happen. Comment below and share something about your favorite rooftop garden and/or recommend a rooftop garden that should be profiled in an upcoming post. Earlier this year I wrote about planting for pollinators. In that post I briefly introduced various things that people can do to encourage pollinator activity in their yards and gardens. One thing that I mentioned was the importance of providing nesting sites. Most pollinators are insects and insects are small, so the distance that they are able to travel in search of food is relatively limited. According to the Xerces Society, the smallest bees can only fly a few hundred feet from their nests. Providing nesting sites in close proximity to foraging sites is incredibly important. Roughly 70% of native bee species in North America are ground nesting bees, so chances are pretty good that if you are providing forage for bees in your yard, a good number of the bees that visit will be ground nesting bees. In order to ensure the survival of these bees, consider providing nesting habitat for them on your property. Create and Maintain Undisturbed Bare Ground: You may already have ground nesting bees living in your yard and you don’t even know it. Obvious evidence of nests is difficult to spot. If you can find tunnel entrances, they will look like small ant mounds. 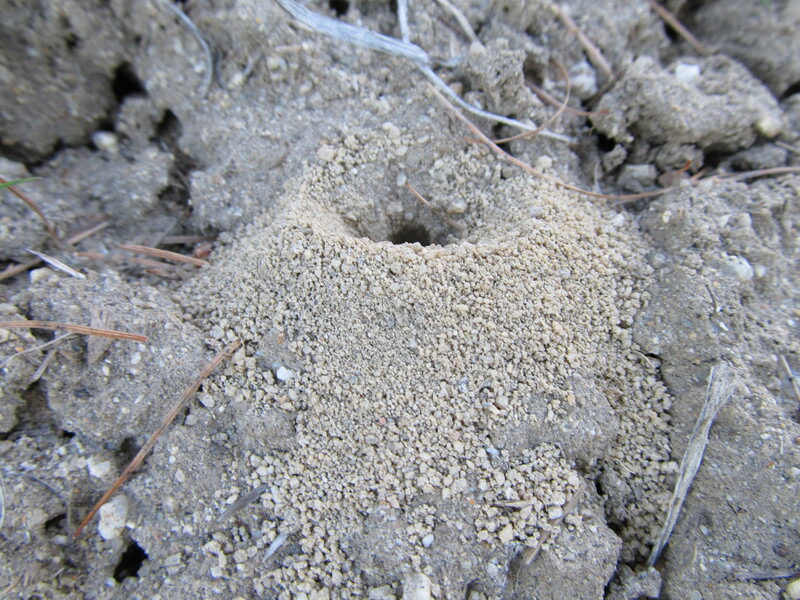 If you find a series of small “ant mounds”, watch for bee activity during sunny times of the day. Activity can be quite ephemeral though, so it is difficult to know if bees have just moved in or if they have moved on. 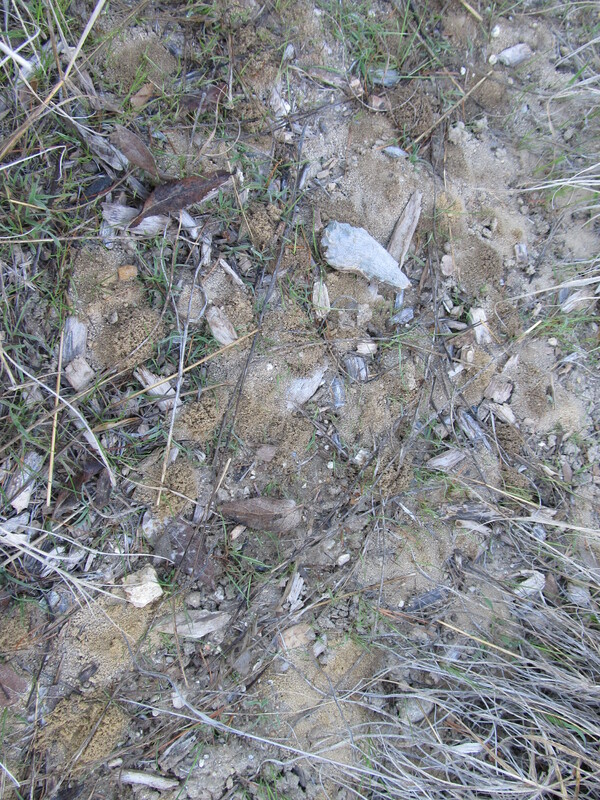 Avoid tilling up soil and walking through areas where you suspect or intend for bee activity. Leave patches of bare ground unplanted and unmulched in order to encourage bees to nest there. Sunny and South Facing: Bees are most active when the sun is shining and temperatures are warm. For this reason they tend to build their nests in warm, sunny spots. However, warm, sunny spots are also the best locations for many plants. Consider sharing these sites with ground nesting bees. Avoid putting down mulch in these areas and keep vegetation sparse and minimal. Avoid Pesticides: When encouraging pollinator activity in your yard and garden, it is best to avoid using pesticides as much as possible. Herbicides kill potential food sources. Insecticides can kill pollinating insects along with pest insects. And soil fumigants can harm ground nesting bees. Provide Some Accommodations: Due to the diversity of ground nesting bees, it is difficult to provide nesting habitat for all potential species. Some prefer loose, sandy soil while others prefer smooth, packed ground. 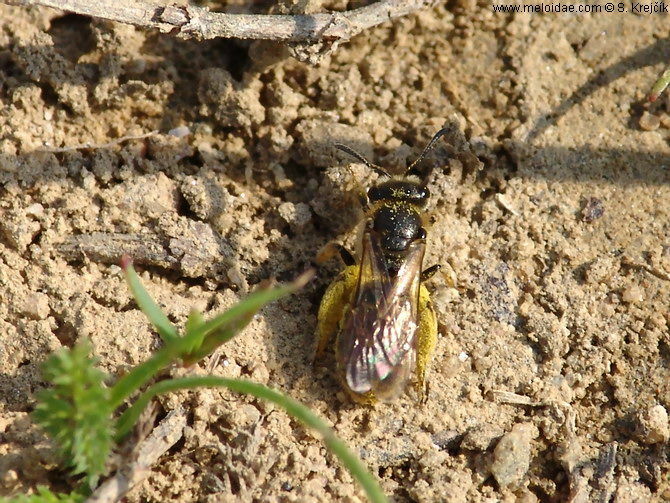 Some bees will nest on level ground, while others prefer sloped ground. The habitat you are able to provide will depend on the conditions present on your property. Some modifications can be made, but this all depends on the resources available to you and how particular you want to get. Apart from maintaining a patch of undisturbed, unmulched, south facing ground, there are three additional things that you can offer ground nesting bees to make them feel more at home on your property: food (in the form of diverse flowers blooming throughout the growing season), a water source (in the form of a birdbath or something similar), and a few rocks for the bees to perch on and warm their tiny bodies. The tunnel entrance of a ground nesting bee. Tunnel entrances are often found in groups in areas of bare ground mixed with patchy vegetation. Last month on Ken Druse Real Dirt podcast, Druse talked to Ken Greene, the founder of Hudson Valley Seed Library. Greene came up with the idea for a seed library while working as a public librarian. The concept: people check out seeds from the library, they plant those seeds in their gardens, they save some of the seeds from the plants they’ve grown, and then they return the saved seeds to the library, at which point the seeds are available for someone else to check out and do the same. Greene started his seed library at the public library where he worked. He soon discovered the great need for educating the public about seed saving, and so he quit his day job and founded his own seed company. Along with carrying on Greene’s original vision of a seed library, Hudson Valley Seed Library is a producer and distributor of seeds, as well as a great resource for information concerning seed saving and other farm and garden related topics (just check out their blog to see proof of this). When Greene first started his seed library, there were very few others. But the idea is catching on. Perhaps you have one in your region. My local seed library is called Common Wealth Seed Library. And speaking of local, in the interview with Druse, Greene talks about local seed growers. They used to be common, but many were bought up by larger companies. However, they are making a comeback. My local seed grower is called Earthly Delights Farm. 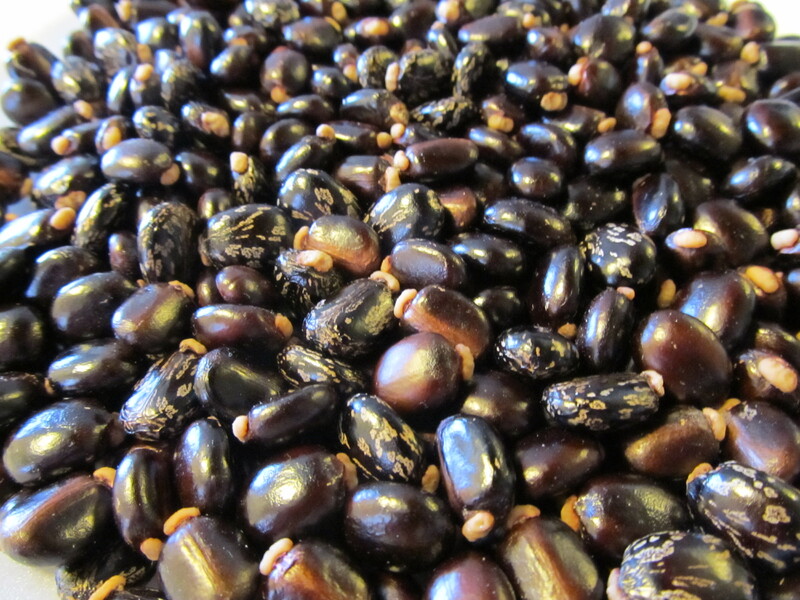 Local seed growers are worth supporting because the seeds they offer have been produced in that particular region. Ideally, they are varieties that have been trialed against similar varieties and selected for their superiority. This means that the selected varieties are likely to do well in that region. Expect more posts about seeds, seed saving, and seed banking in the future. In the meantime, share your thoughts about anything seed-wise in the comment section below. 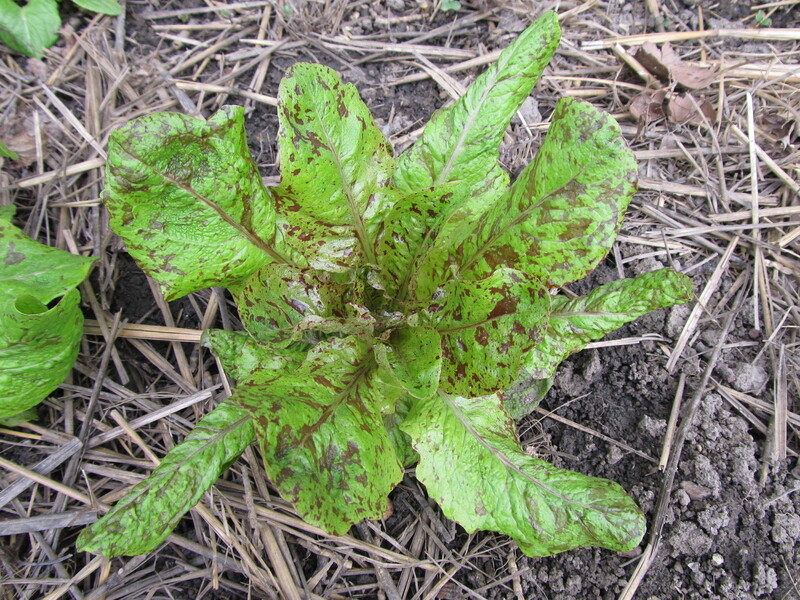 I overwintered some lettuce, and so can you. Below freezing temperatures usually mean the end of the growing season for most things, but certainly not for everything. The truth is that salad greens (lettuce, spinach, kale, etc.) 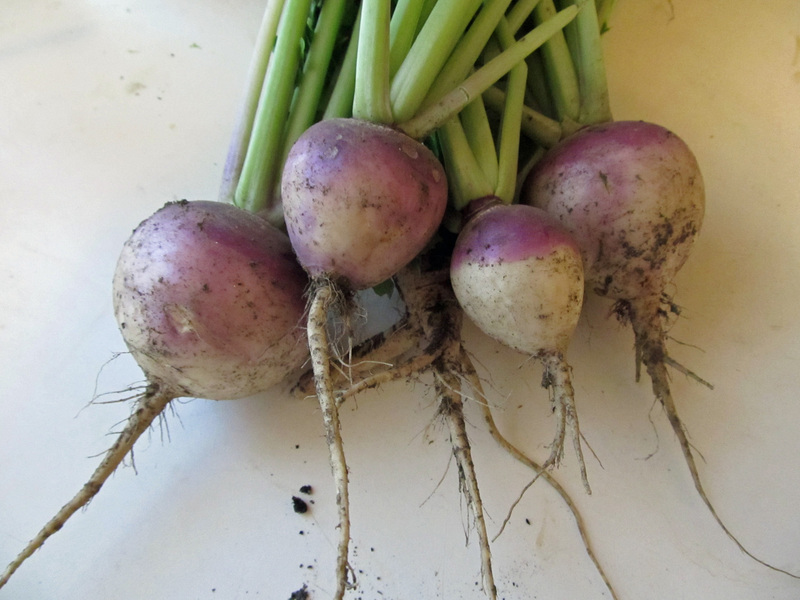 can be overwintered, especially if you grow them under a cold frame or hoop house or in an otherwise protected location. Some can even be harvested throughout the winter if the conditions are right. Last fall I had nine lettuce seedlings that I had started indoors. I transplanted them outside in either late October or early November (memory isn’t serving me right now). 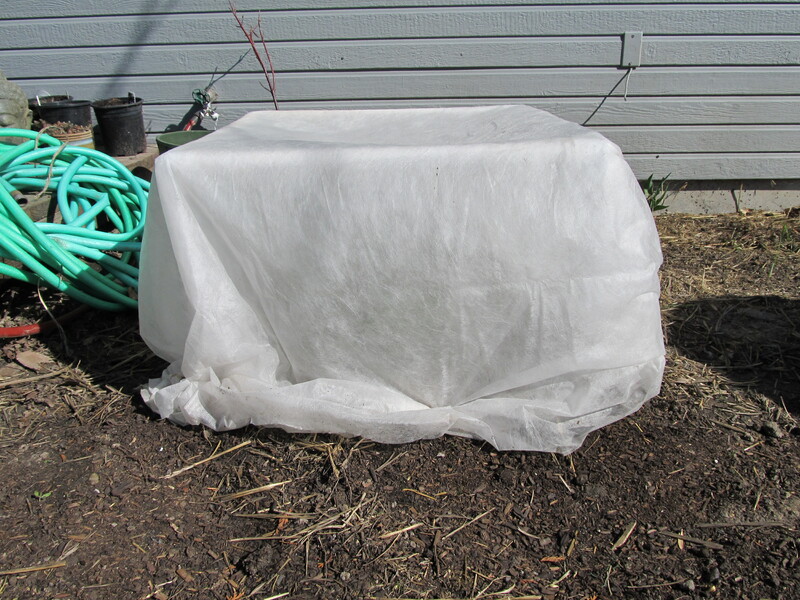 I placed some straw mulch around them, and then covered them with a makeshift cold frame made out of PVC pipe and floating row cover. There they remained all winter long. I live in Boise, Idaho. The winters here are relatively mild (compared to the rest of Idaho), but we still have plenty of days with below freezing temperatures. 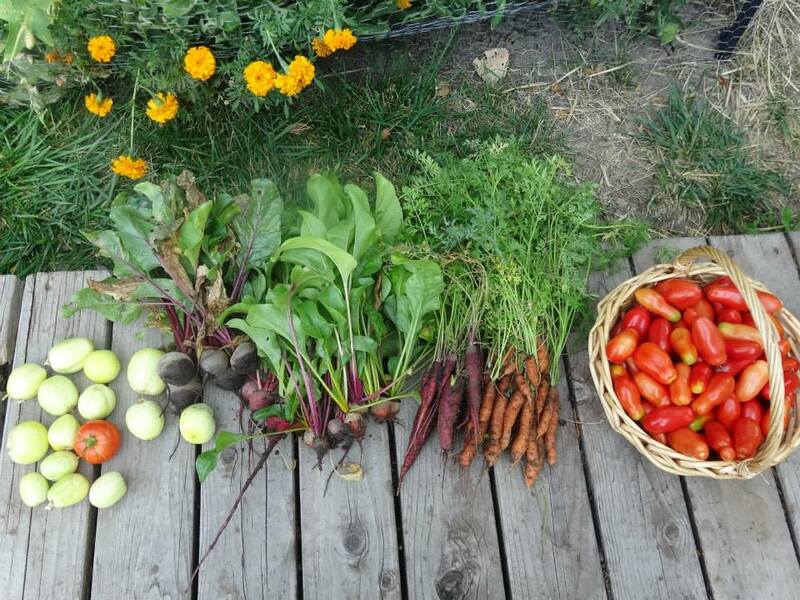 Our frost-free growing season is about 160 days long. The average low temperature from December through February is around 25° F. This past winter, our lowest temperature (according to Weather Underground) was -7° F, and we had at least 30 days in which the low temperature reached 20° F or lower. Needless to say, it was a chilly winter. 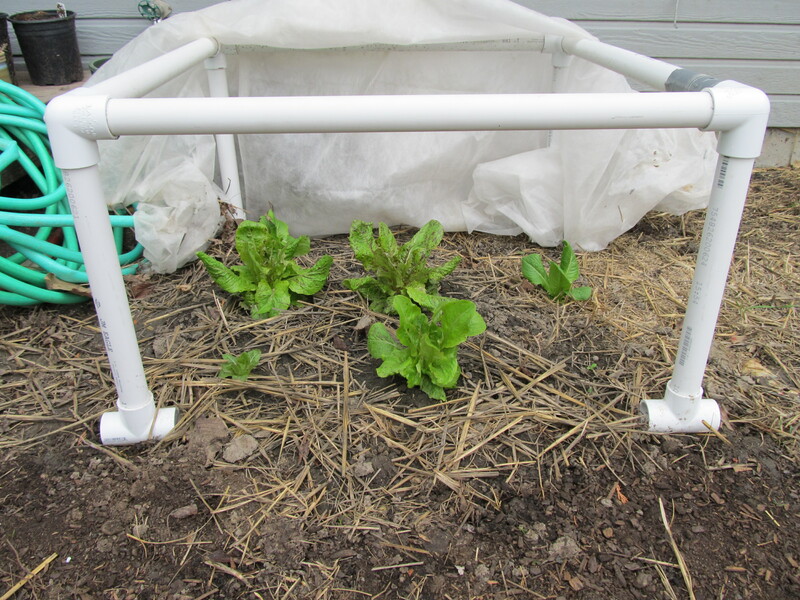 But my lettuces held on…at least most of them. When I uncovered my cold frame in early March, I found that six of my nine lettuce seedlings had survived. It didn’t surprise me that a few had perished – some of the seedlings that I had transplanted were quite small, and I had serious doubts that they would make it. I was satisfied to see that the majority of them were still alive. Two-thirds ain’t all that bad. The varieties that I planted were “Freckles” and “Winter Density.” I chose these because the descriptions I read gave me the impression that they were ideal for overwintering. But descriptions be damned. I suggest seeing for yourself. 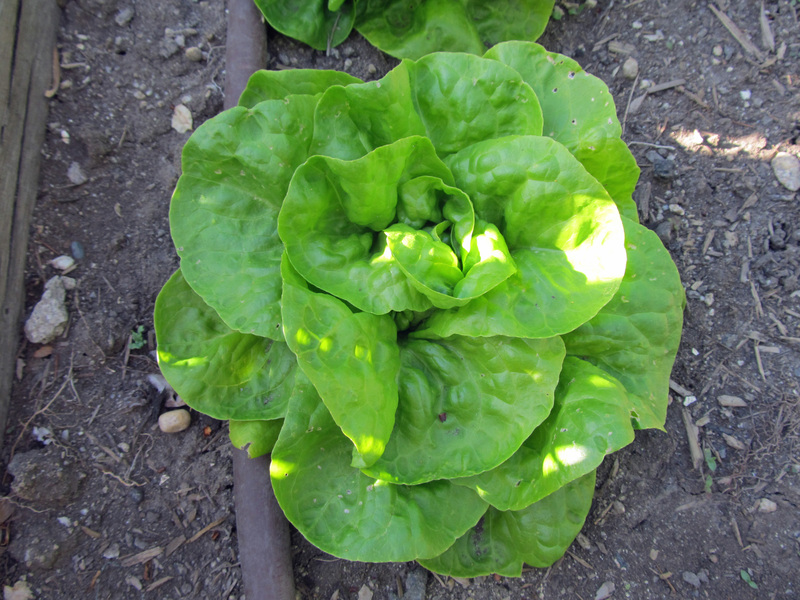 Take any variety of lettuce or other salad green and experiment in your own garden. See what you can get to overwinter with or without protection. Seeds are fairly inexpensive, and it is worth seeing what you can get to survive through the winter. Differing climates – both macro and micro – will produce varied results, and every year things will be a little different. This is one of the many joys of gardening. Weather and climate will always be factors, but they can also be markers to help us see what we can get away with. And if one of the things you get away with is getting lettuce to survive a harsh winter, it means you will be eating garden fresh lettuce long before your neighbor. 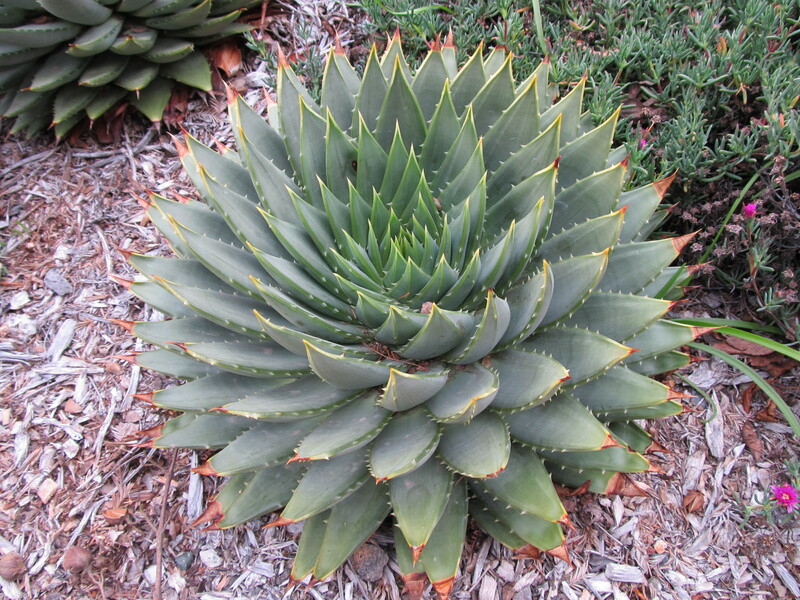 Last week I attended a workshop at the University of California Botanical Garden at Berkeley. Apart from receiving valuable training on how to monitor for and report plant pests and diseases in a public garden setting, I also had a chance to explore the garden. 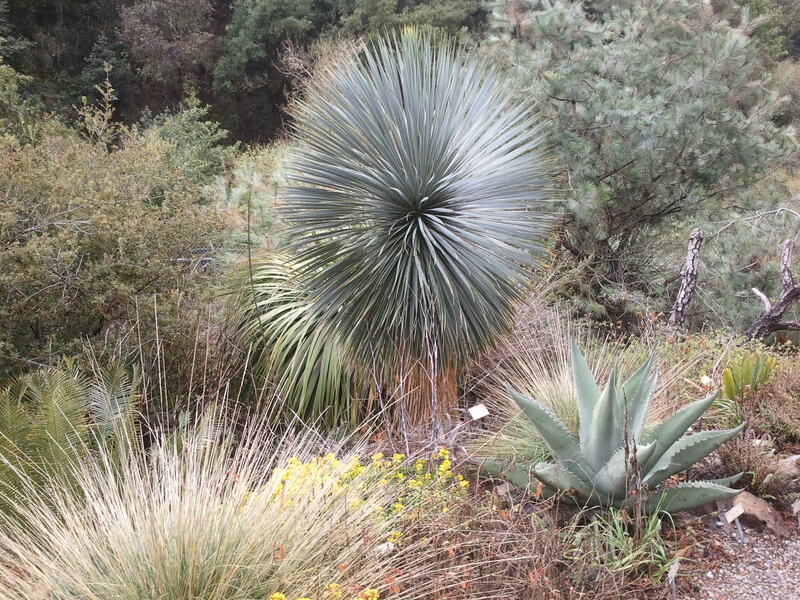 UC Berkeley’s botanical garden is located in Strawberry Canyon in the Berkeley Hills. 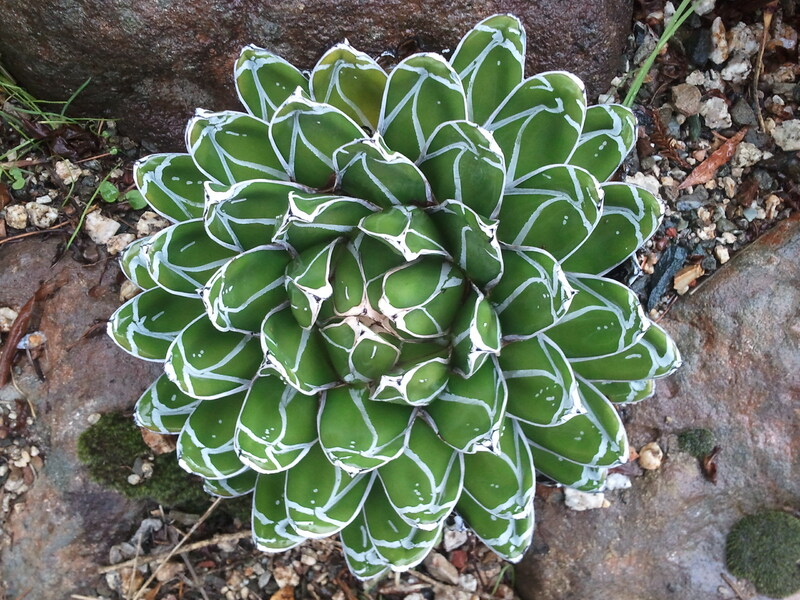 It covers 34 acres and features plant collections from around the world, including South Africa, Asia, Australia, New Zealand, the Mediterranean, and the Americas. 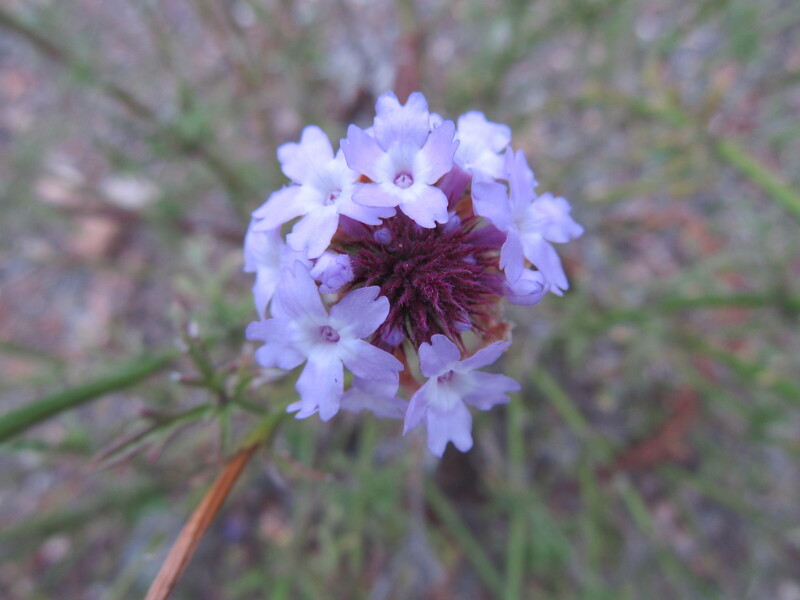 Most of the plants were collected from the wild or cultivated from wild collected plants, and a large number of them are rare or endangered species. I was very impressed with how beautifully designed the various gardens are, each display loaded with hundreds of different plant species all meticulously labeled. 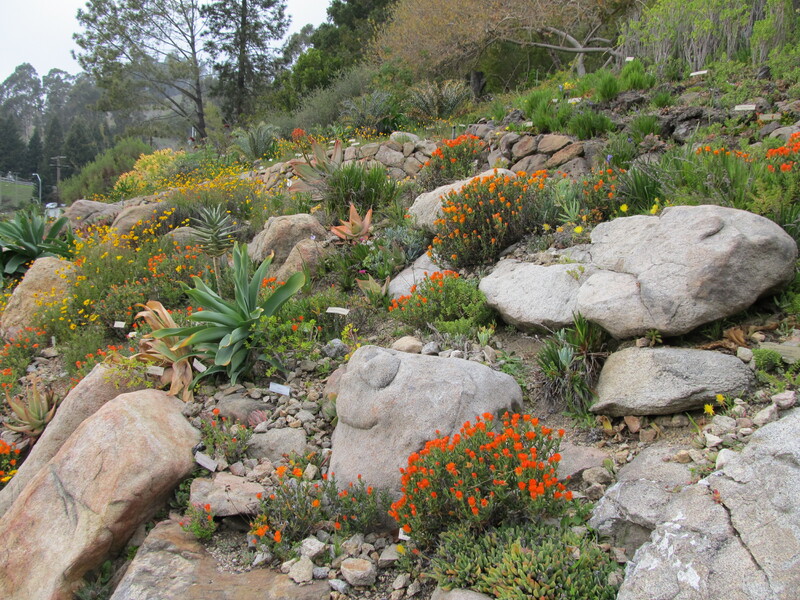 Because the garden is located in a canyon, the majority of the beds are on slopes, so there has been lots of great rock work and terracing done to create them, and there are numerous side paths that take you off the main path and up into the gardens, giving you the feeling that you are exploring a natural area. 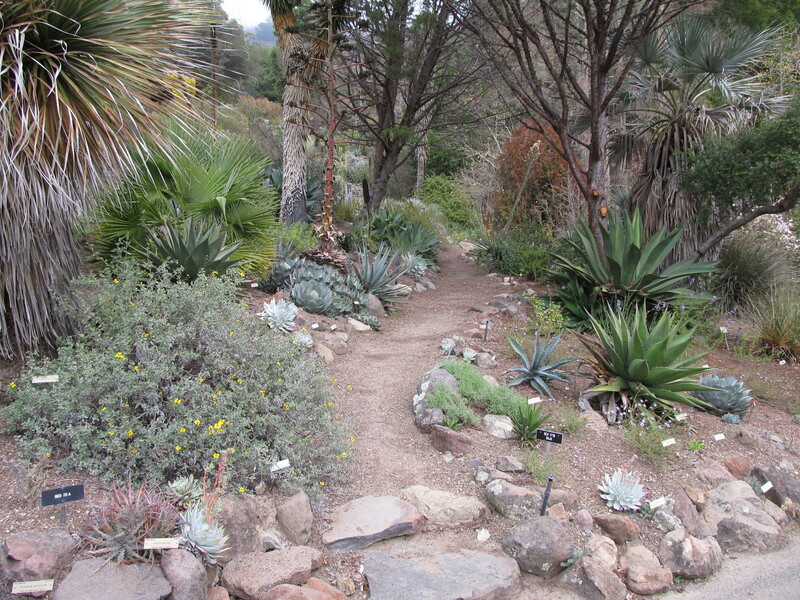 Also impressive is the garden’s focus on plant conservation. If you ever find yourself in the San Francisco Bay area, I highly recommend spending some time at this garden. With any luck, I’ll make it back there again someday. The limited time I had to spend there certainly wasn’t enough to explore it fully.